Now CLIA Waived! K Number in CLIA Database is K122904. The test cup is activated by a Key, held in possession of the administrator, until after the donor has filled the test cup with their specimen. 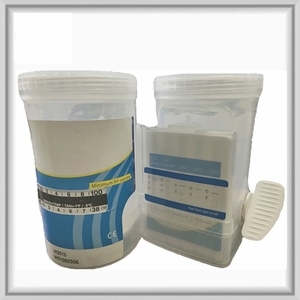 The test cup container has a temperature strip for specimen temperature. Remove the key and insert into the mechanism�on side of cup. A rose-pink band is visible in each control region. No color band appears in the appropriate test region. It indicates a positive result for the corresponding drug of that specific test zone. A rose-pink band is visible in each control region and the appropriate test region. It indicates that the concentration of the corresponding drug of that specific test zone is below zero or the detection limit of the test. If a color band is not visible in each of the control region or a color band is only visible in each of the test region, the test is invalid and another test should be run to re-evaluate the specimen. ALL ORDERS ARE SHIPPED IN A DISCREET PACKAGE!!! Now we accept Money Orders or Personal Checks by mail. We will send your order as soon as we receive your payment. We accept VISA, MASTERCARD, American Express and Discover cards.